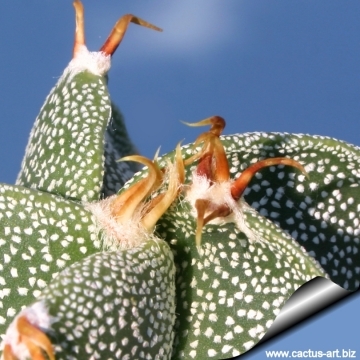 This beautiful plant of unknow origin - as the name indicate - bears very unusual short twisted spines. 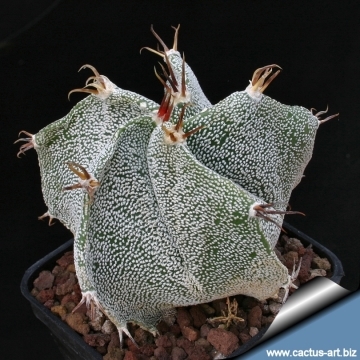 Description: The only thing known about this particular cultivar is that one of the parents may be Astrophytum myriostigma or Astrophytum coahuilense as the five ribbed stem structure clearly shows, while the best candidate for the other parent is Astrophytum capricorne . 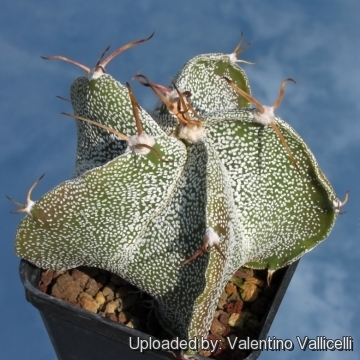 But the particular spination is so particular that there are many contrasting opinions about the true genealogy of this plant. 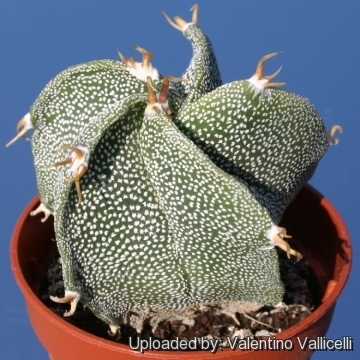 Stem: Unbranched, globular to cylindrical, bright green, covered with many white hairy scales spaced and similar in size to those of A. capricorne that give it a silvery-grey appearance. The scales are composed of very fine interwoven hairs, which, under a microscope, are very pretty object. A transverse section reveal a perfect star shaped form (like the common star-fish) giving the plant the appearance of a bishop's mitre. Ribs: Usually 5, that increase with age, vertical, regular, deep, prominent, very broad and acute. Spines: Twisted, recurved, sometime forming apical ringlets or small irregularly shaped hooks, yellow to brownish. Flowers: Funnelform, yellow with a red center. Cultivation and Propagation: Relatively easy to cultivate it is sometime seen as a grafted plant but grows very well on its own roots too. Use mineral well permeable substratum with little organic matter (peat, humus). 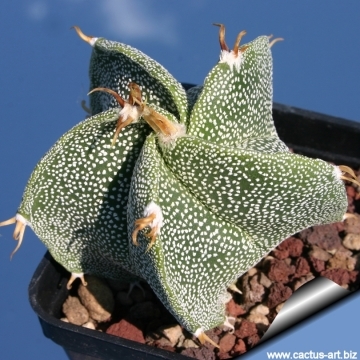 The Astrophytum grows much faster with a low nitrogen content fertilizer in spring and summer. 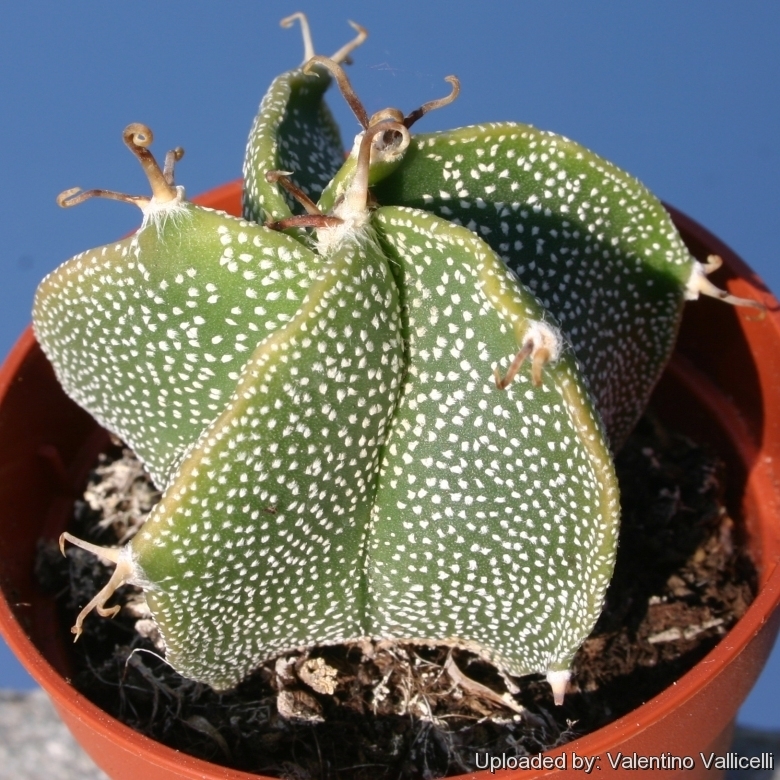 Water sparingly from March till October, the thin, fibrous roots suffer if there is humidity, therefore the plant should be watered only when the surrounding terrain is dry. Keep dry as soon as the temperature starts dropping in October and keep it perfectly dry in winter at temperatures from 5 to 15 degrees centigrade. 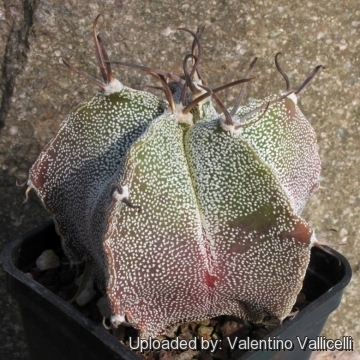 (but it is Hardy to -7°C for short periods) Although it is one of the easier Astrophytum to grow, they tend to rot at that time of the year, if kept wet. In the rest period no high atmospheric humidity!! Sun Exposure: Light shade to full sun, its colour tends to richer and darker when grown in light shade.